While fantastic to look at, Riven Slate tiles can be particularly difficult to keep clean. The natural unevenness of the stone causes dirt to become more easily trapped and more difficult to remove. 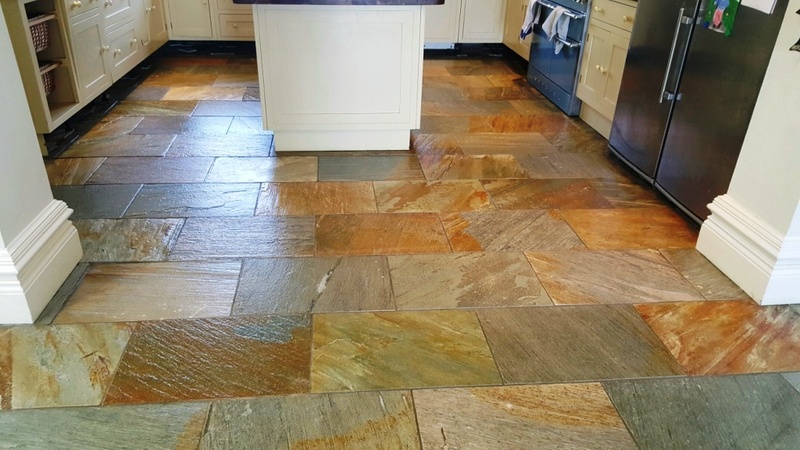 Over time, heavy buildup of ingrained dirt can have the effect of dulling the colours in the stone. 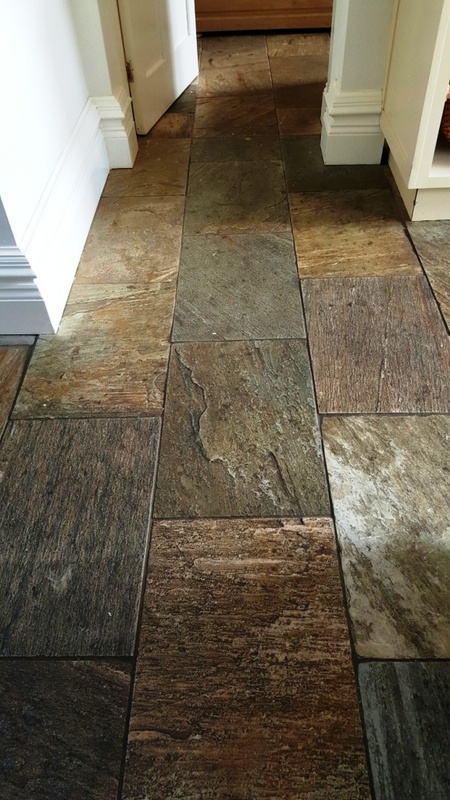 This was the case with this large area of Riven Slate tiles at a very busy farmhouse in the Lincolnshire port town of Boston, the original namesake for the perhaps more famous city in Massachusetts, USA. The property owner couldn’t figure out the best way to improve the situation and so called me in to see what could be done. 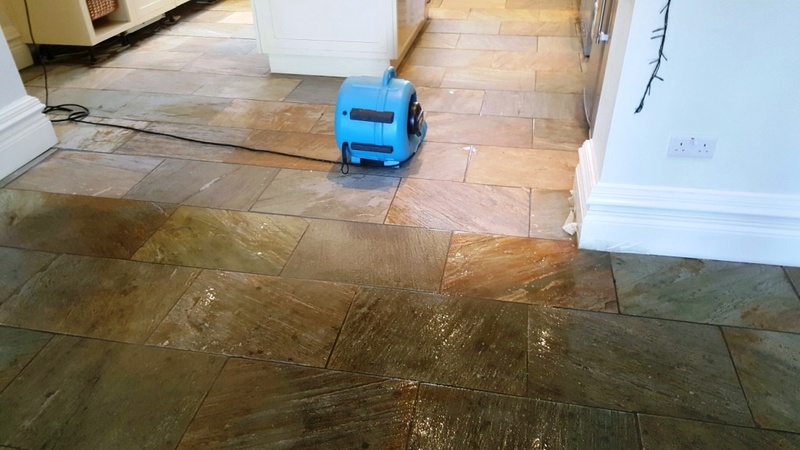 Upon inspecting the tiles first hand I decided that the best course of action would be a very deep clean and the application of a fresh sealant to offer long-term protection against ingrained dirt. The cleaning process was split into two main components. Firstly, I scrubbed a strong dilution of Tile Doctor Pro Clean into the tiles to remove the initial layers of soil buildup. 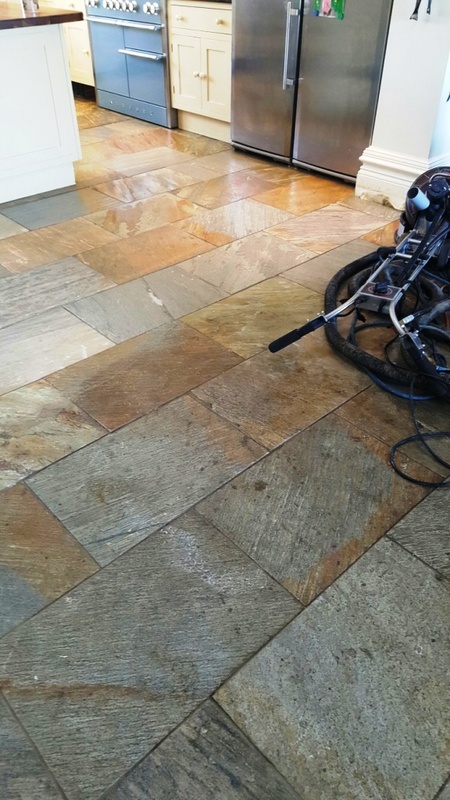 Pro Clean is our go-to cleaner for most natural stone due to its reliability and the fact that, unlike a lot of supermarket floor cleaners, it isn’t acid-based and so won’t damage the stone. Since the ingrained dirt problem was quite severe, I opted to also clean the tiles using our van-mounted pressure cleaning system. This very efficient system applies hot water under pressure to the to stone to penetrate deeply and eradicate particularly stubborn ingrained dirt. It then automatically extracts the soiled water back into a tank in our van. Satisfied that the floor had been cleaned as throughly as possible, I then installed several turbo dryers to thoroughly dry the flooring, allowing it to be ready for sealing the next day. 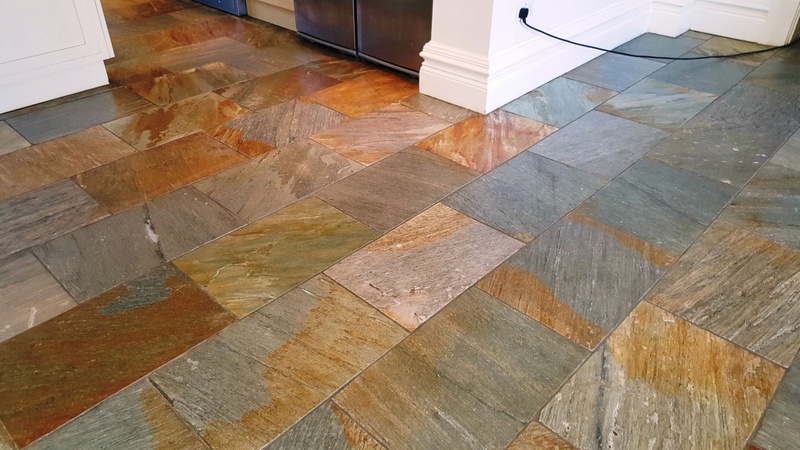 Efficient drying was especially important here due to the amount of water used in the cleaning process; many tiled floor owners will already know that sealant cannot be applied if any moisture remains. To seal the tiles I used four costs of Tile Doctor Seal and Go. This is a topical sealer, meaning it forms a robust layer of protection on the surface of the tiles. Seal and Go also helps to enhance colour while providing a natural look matte finish that complements the natural stone. Looking at the photos of the floor before and after my work you can really get an idea of the transformation achieved in a short space of time. What a difference! The property owners were very pleased with the results, especially now that they are aware of the best way to keep their lovely Riven Slate tiles clean and protected. 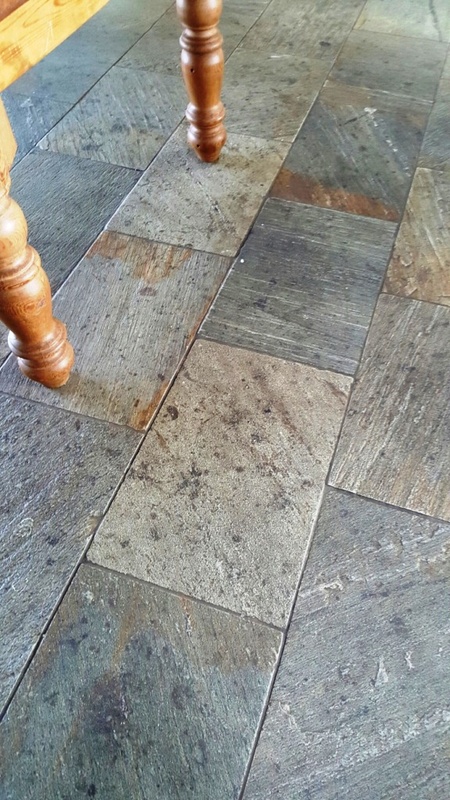 This entry was posted in Slate Tile Posts and tagged Boston, farmhouse, Lincolnshire, slate tiles, tile cleaning, tile sealing by AbzDominise. Bookmark the permalink.